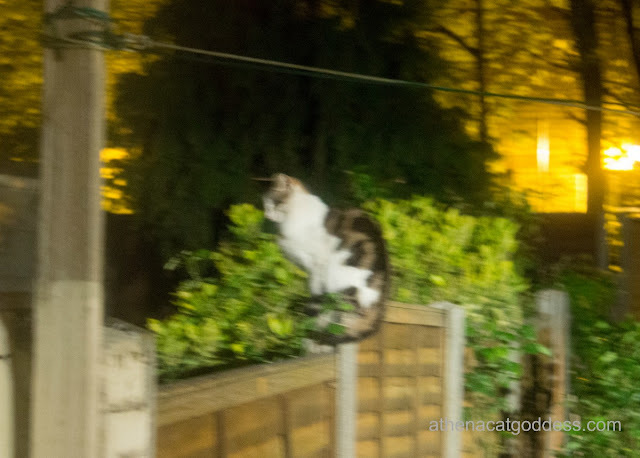 I was looking out of the patio door at night before going to bed and I saw this INTRUDER on the fence. Mum took the photo and told me to forget about him, he will go. But I don't like him. He pooped on our lawn the other day. But I did forget about him and followed Mum upstairs to bed. At least I have a nice warm bed and a lovely human to cuddle up to at night. I bet he doesn't have that. He is out roaming the streets and gardens at night and is at risk from all the dangers lurking out there. It is not safe to be a cat any more in London. In fact, I doubt that it's safe anywhere. Before we go, we have some exciting news! 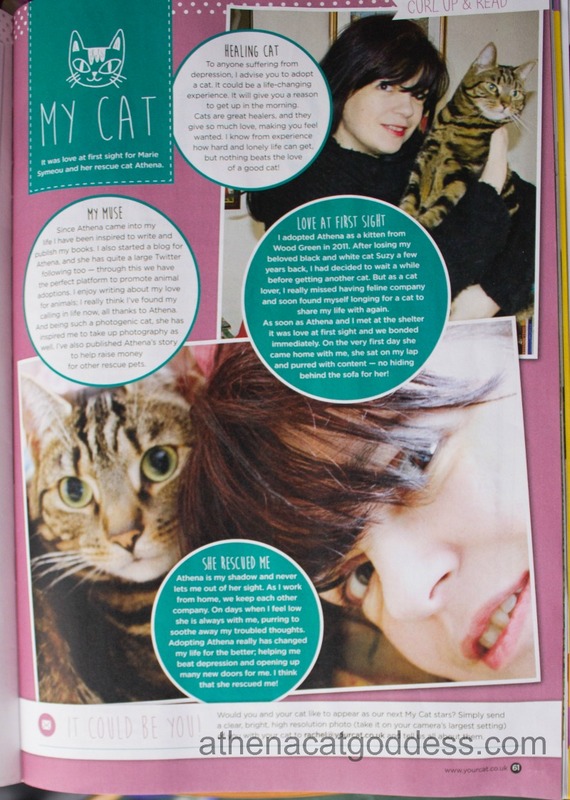 If you live in the UK you will be able to see us in the June issue Your Cat Magazine (out in the UK on May 15th). We are so happy because it's our favourite magazine and Mum is a subscriber so we got our copy early. 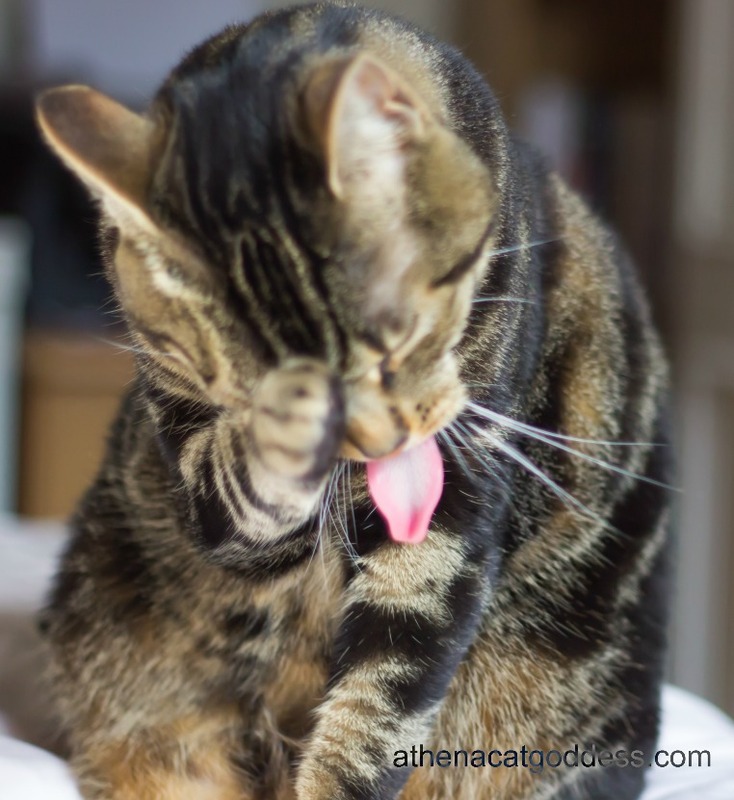 Congratulations on being featured in Your Cat, Athena - that is awesome! I saw an kitty out my favorite perch today - but she was not on my property, she was next door. I think she was more disturbed about seeing me than I was her - usually other cats don't bother me much. Thank you :) I don't like other cats in my space. One of them (not this cat) annoys me all the time just because he thinks my garden is his as he was here before me. He is a nasty bully. Hopefully the intruder has a safe home to return to at night. I agree it is not so safe for cats to be outside here either. Congrats on being featured in Your Cat! That's very exciting! Now I hope you didn't shred the curtains! Thank you. It is a shame some cat owners don't realise how dangerous it is for cats out there. Congrats on making it into a magazine! How pawsome! They did a good job with the layout of the article too :) You both look great. I hope your granny was forgiving about those curtains! Congrats on bein in a magazine! Congratulations on being in a magazine- that is so cool :) I wish I could see it, sometimes Barnes and Noble has magazines from the UK so I will check. 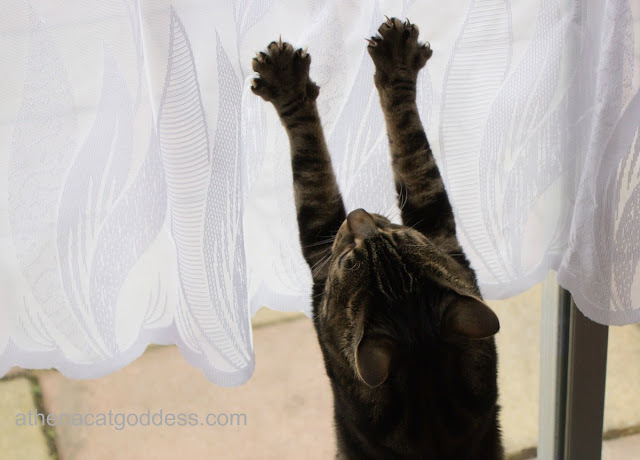 Cute photos of Athena- oops about the curtains. How exciting to be in a magazine! Congratulations! Hope your intruder stays away! Concats to you being in the mag! So cool! How dare that intruder poop in YOUR yard, Athena! How rude! We loved your claws and tongue out pictures, sweet girl. And how awesome that you and Mum will be in Your Cat. ConCATulations! We sure wish we lived in the UK, so that we could see it! Love your Pictures Athena!!!! Concats on being in the magazine! How exciting! That introoder better hit the road! Thanks. It's one of those features where readers are invited to send in photos of their cats and say why their cat is so special. I thought it was worth a try. I never expected to be featured. Have never been lucky with that kind of thing. I know. The nerve of some cats! How awesome to be featured in a magazine you love. Nicely done! Concatulations on your magazine spread! That is so exciting.